The Saints top-10 picks from last year’s NAB AFL Draft Hunter Clark (MID, $258,000) and Nick Coffield (DEF/MID, $256,000) both caught the eye, with Coffield a lock at this stage. He looked great across half back with 20 possessions and five marks for 74 while Clark was also good with two goals and 51 points from only 61% game time. David Armitage (MID, $459,000) was limited to just two games last season with a groin injury and did enough to warrant consideration. He walked straight into the inside mid role and after a slow start finished with 79 points from 24 touches. You couldn’t do it but Paddy McCartin (FWD, $336,000) looked great and is going to be the man up forward. He kicked two goals and took five marks for 70 points… If he was under 300K, it would be a tough call. Former North Melbourne defender Aaron Mullett (DEF, $513,000) has been a player of interest Re: the Docherty role but put a line through that after he scored 36 from 78% game time. The most prolific Blues defender was in fact Caleb Marchbank (DEF, $489,000) who tallied 25 possessions and six marks for a team high 90 and looked awesome doing it. Former Giant, and centrepiece of many mid price break out discussions, Matthew Kennedy (MID, $485,000) was a disappointment with just 40 point, as was fellow break out contender Charlie Curnow (FWD, $502,000) who scored only 42 despite having stints on the ball. Carlton also picked top-10 draft picks Paddy Dow (MID, $266,000) and Lochie O’Brien (DEF/MID, $252,000) for their first games (No disrespect to my AFLX). We will need to give Lochie another go after a slow start but Dow looked right at home with 13 possessions, 2 goals and 60 points from 63% TOG. A couple of touches oozed class and he will be a walk-up starter in round one. As far as premiums go, Patrick Cripps (MID, $692,000) did enough to suggest he is in for a huge year. He looks great following an uninterrupted pre season and seemingly collected possessions at will on his way to 82 with two goals. Ruckman Matthew Kreuzer (RUC, $740,000) looked really impressive pushing forward for two goals and will once again contend for the number one big man in the comp. Reactionary actions: Get in Coffield and Dow, move Marchbank and Armo up your draft rankings a little. 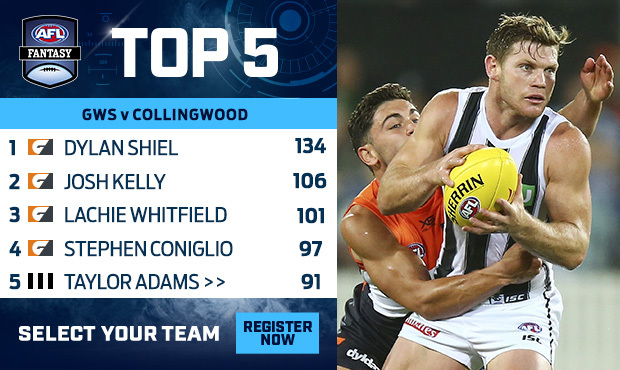 Roy has been keen on Stephen Coniglio (MID, $663,000) since Fantasy opened up. Being priced at less than 100 and with the potential to go to that 110 mark, Cogs ticked all boxes tonight and would be one of those under-priced midfield guys that we should be considering. 97 from 84% TOG (28d – 13 contested, 3m, 5t) was pretty to watch. Fellow midfielder Dylan Shiel (MID, $666,000) pumped out the highest score of the JLT thus far with 134. He collected 29 touches, nine marks four tackles and to help boost his score, kicked two snags. In the free flowing game, which the Giants won by 10 goal against an easy fantasy opponent, Shiel dished up what we would love to see consistently. Josh Kelly (MID, $795,000) did what he needed to do with 106 in 78% TOG. It has been spoken about but we got to see it with our own eyes, Lachie Whitfield (MID, $690,000) will be playing in the back-half of the ground this year. He is such a good user of the ball and managed to rack up 25 touches with a whopping 9 marks – sitting back there with Heath Shaw (DEF, $565,000) – which could be a lethal Fantasy combo. Also a handy thing with Whitfield likely to be a DEF come round six. I loved Heater sucking me in. He’s bloody cheap and with the departure of Nathan Wilson and the season ending injury to Nathan Williams, surely he is going to return somewhere near his best this year. His 82 from 73% TOG was impressive – mainly due to the fact he had 20 kicks with just 2 handballs. Heater doing Heater things. The thing to keep in the back of your mind is that Shaw didn’t get one ounce of attention tonight. Eyes were on Jeremy Finlayson (DEF/MID, $170,000) who played in the backline. As a bargain basement priced player, if he’s there in round one, then we lock and load. 55 from 82% TOG was a nice return and he looked at ease out there, busy early. Finlayson averaged 103 in the NEAFL last season from 8 games. He played one senior match but was injured in the first half for 20 points. Other rookie priced players of note were Zac Langdon (FWD, $170,000) who had 37 from 65% TOG and Lachlan Tiziani (FWD, $170,000) who kicked two goals to help him to 54 from 59% TOG. Both played forward. If they’re playing in JLT2, then they could be a chance for round one with the former a 22 year old with the opportunity to take the Devon Smith forward role. Slot him into your side for now! Nick Shipley (MID, $170,000) had some midfield time, but he looks like he could be a little way off. For those thinking about Rory Lobb (FWD, $467,000) – who didn’t play tonight as he’s still battling his groin injury, the Giants are a big chance to roll with Dawson Simpson (RUC, $420,000) as their main man despite being slaughtered by Grundy in the ruck (29ho to 11). The Giants were without quite a few starters tonight, including Ryan Griffen who the General put out for the evening. 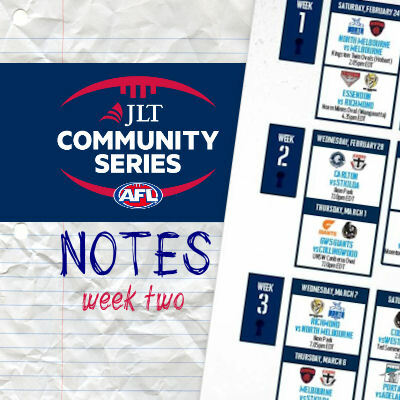 JLT general soreness… hmm! Taylor Adams (MID, $808,000) was the best for the Pies with 91. He didn’t attend one centre bounce, and while he was all over the ground… running as he pleased, he was predominately off half-back – the same role that got him that DPP for last season. It’ll be interesting to see if he is any chance to be DPP. The way he plays the game, Adams is a great starting pick in Classic with his piggish tendencies… and a definitely first rounder in Draft. Sneaking forward at times, you can see why Steele Sidebottom (MID, $745,000) is one of four players to have averaged more than a ton in the last four seasons. Safe pick in the third round of Draft. I’ve been high on Jack Crisp (DEF, $622,000) who averaged 88.3 last year and finished the season well playing the half-back role which was confirmed tonight. 12 kicks, four handballs and 58 points didn’t set the world on fire, but I’m still ok with him being an option down back. Still a huge chance for Crisp to be a top 6 defender. Josh Thomas (FWD, $439,000) popped up on the radar following his 76 from 73% TOG. Easing back into it last year, he has 10-15 points upside and might be better than some of those other names floating around as mid-priced options up forward. I’ll be watching. 22 disposals with 13 of them contested showed that he was around the ball plenty. Keep an eye on the steak lover. The Cox-effect will be a worry this year on Brodie Grundy (RUC, $748,000). Freako tells me that Grundy attended 51 ruck contests to Cox’s 14. Grundy scored 65 as the best ruck on the ground (29 hitouts). Mason Cox (RUC/FWD, $418,000) finished with just four hitouts, but kicked 1.2 and took four marks playing mostly forward. Jaidyn Stephenson (MID/FWD, $260,000) appears in almost 15% of teams. He found the ball 13 times for a score of 38 (80% TOG). He gave away two free kicks and on many occasions he was unlucky… for example, could have had a nice +6 but the ball went out on the full or as he was about to receive a ball, it was chopped off due to a poor disposal. I think he may have a bit of work to cement himself a spot in round one, but he was able to move around the ground nicely and with the FWD injury woes, the Pies would be keen to get him in there. Tassie lad Brody Mihocek (DEF, $170,000) is a 25yo, 192cm key position defender who played 87% of the game and scored 48. Hopefully he’s in the side next week. Fellow basement priced defender Flynn Appleby (DEF, $170,000) scored 49 and played significant game time as a small defender. Appleby was able to collect 11 touches and take five marks. Adam Oxley injured his shoulder. This afternoon I sat down on my phone and watched the Dogs vs Hawks game on my huge Samsung screen, and I was much more impressed than the North vs Dees game last week! The Dogs ended up getting on top of the Hawks with a great second half, but the game was well fought and there was a plethora of Fantasy relevance around for coaches! We’ll start with the winners, and boy did the Doggies look pretty good, moving the ball nicely and attacking from half-back, with a bit of wayward kicking costing them a bigger score. The highest scorer for them was Josh Dunkley – FWD $517,000 (BE 73) with 104 Fantasy points from 84% TOG, impressive for a bloke who hasn’t been talked about too much in Fantasy aspects. He played mostly up forward, pushing down the ground to the wing every now and then. He did need 3 goals to help him to that score but the man did look very lively. Whilst I probably wouldn’t pick him in Classic, he should be pretty draft relevant and could be one to watch out for. Also scoring well and pushing up forward for a while were the two stars at the Dogs, Jack Macrae – MID $732,000 (BE 104) and Marcus Bontempelli – MID $706,000 (BE 100), 92 Fantasy points (80% TOG) and 100 Fantasy points (83% TOG) respectively. Bont in particular was impressive for me, especially at one point in the third quarter where he was put in the centre and the Dogs kicked 3 successive goals, all off his clearances. He was dominant throughout the whole game and may be one to look at if he breaks out properly. Macrae was also very solid, especially in the first half, and could be a great chance at Forward DPP throughout the season going by this game. I just can’t bring myself to pick him as a straight Midfielder though, but think about him in your draft leagues. The one that really impressed me however, especially in the first half was Aaron Naughton – DEF $254,000 (BE 36). Whilst the rookie did only manage 51 from 84% TOG, he looked very solid against a mature Hawthorn forward line and read the play really well. In my opinion he has locked himself in for a Round 1 spot, however they did play Easton Wood forward for the day, so if he moves back that might push Naughton out. The Dog’s defense really had a field day, with Shane Biggs – DEF $542,000 (BE 77) 100 (79% TOG), Bailey Williams – DEF $437,000 (BE 62) 98 (79% TOG), and Hayden Crozier – FWD $467,000 (BE 66) 78 (86% TOG) all having significant outputs. If these guys can keep this up then they are great value, in particularly Williams, but I just can’t see how all these Doggies’ Defenders can score so well every week. See what the trends are next game, but definitely keep an eye on the Bulldog’s backline. MID/FWD trio Luke Dahlhaus – MID/FWD $624,000 (BE 89) 51 (73% TOG), Toby McLean – MID/FWD $603,000 (BE 86) 64 (87% TOG), and Lin Jong – MID/FWD $505,000 (BE 72) 21 (52% TOG) were all insanely disappointing and I wouldn’t touch the first and last one with a 50-foot pole. McLean is an interesting one, with a lot of people keen on the 2017 breakout player. With only the eye-test to go by, McLean played completely in the midfield and just went missing, especially in the first half, coming in at half-time with around 20 points to his name. That gives him a roughly 40 point second half, which showed that he could definitely still score well, however I just wasn’t all that impressed by what he showed me. Another one to stay away from is Jason Johannisen – DEF $535,000 (BE 76), who had 73 points from 82% TOG. Whilst the score doesn’t seem too bad, he played the first half in the Forward pocket and did sweet bugger all. He then got moved down the ground for the second half and the Hawks let him run free to rack up a few cheap disposals. I’d want MUCH more consistency with his role before I picked him up as a mid-pricer. Lastly, Mitch Honeychurch – FWD $462,000 (BE 66) really impressed me in today’s game but he is certainly no best-22 lock for the Dogs. He had 77 from 79% TOG playing off half-forward and really getting amongst it. He did have 2 goals but I’d say you can expect at least one sausage roll from him every time he takes the field. He’s one that always seems to find a spot in my team at some stage every year, hopefully this is a year he gets a game. For the Hawks there is obviously one name that stands out above all else. The love of my life, Tom Mitchell – MID $896,000 (BE 127) was absolutely insane as is the usual for him, managing a measly 111 from 83% TOG, a laughable pre-season score from the pig. He had 30 disposals and was all around the ground, plus he even got some attention from a couple of Dogs midfielders at some point. Can’t wait to see what he can manage in the season when he actually tries. The other popular Hawks midfielder, Jaeger O’Meara – MID $438,000 (BE 62) was a bit disappointing after an insane intraclub match, managing just 16 disposals and finishing with 61 points from 85% TOG. He did look good when he got it and had some beautiful crumbs, but he just couldn’t get enough of the pill and definitely has me worried about his scoring output. 100% a case of #StayStrongJLT but I’d be watching carefully next week. James Sicily – DEF/FWD $523,000 (BE 74) is becoming an ever more popular option in people’s teams and he had an extremely interesting day. Sicily spent the first half of the game being “tagged” by Easton Wood, who absolutely towelled him up in the first quarter, keeping him to just 12 points, before Sic turned the tables on him in the second and managed a cool 35 Fantasy points. The third quarter then saw Sicily get 4 separate opponents and struggle to find his way into the game, with only 15 points in the third, but then the Dogs went back to putting Easton Wood on him and Sicily managed a 20 point quarter, ending with 82 Fantasy points from 84% TOG. I think Sicily is a pretty safe option, especially if he can cop that much attention and still manage an 80 in JLT. One more thing to note is that Easton Wood managed just 1 touch in the first half whilst tagging Sicily, and that came with 2 minutes left to go in the second quarter, which doesn’t seem like a very efficient way to tag somebody. People who keep telling me Ryan Burton – DEF $594,000 (BE 84) is a better option than Sicily are just outright wrong after Burton managed an insane 37 from 85% TOG. I shouldn’t have to tell you but stay away from picking him if you want to do well this season. Much more draft relevant, but forward duo Jarryd Roughead – FWD $593,000 (BE 84) and Luke Breust – FWD $501,000 (BE 71) really impressed me with 11 shots on goal between them and managing 76 (82% TOG) and 81 (74% TOG) respectively. I don’t see them having this sort of impact all the time, but they were everywhere, moving really well and just dominating the loose Dogs backline. Definitely ones to consider late in draft, particularly Breust who looked extremely impressive to me. Lastly, rookie options Oliver Hanrahan – FWD $170,000 (BE 24) and David Mirra – DEF $170,000 (BE 24) had a pretty mixed day. Hanrahan started the game and had a great first half, with 25 at half-time and looking very lively, before managing just a 5-point second half and ending on 30 points from 73% TOG and probably not getting a game. Mirra played only the last quarter and looked solid in defence, managing 11 points from 23% TOG however the fact he only played a quarter worried me in terms of job security. Neither really looked like they were best 22 unfortunately. It is a bit hard to take too much out of the game from a Lions’ point of view, not only because they were outclassed by the Swans, but they were missing some of the most important personnel from their squad. Notably, midfielders Dayne Beams and Dayne Zorko were missing as well as boom recruit Luke Hodge. First up, Stefan Martin (RUC, $703,000) showed us what we already know… that is, he is up there as one of the best premium ruckmen in Fantasy when he’s doing the job by himself. No Archie Smith (plus Oscar McInerney named emergency) let Big Stef run around and do as he pleased, racking up 21 disposals around the ground to go with his 26 hitouts. No marks, which is uncharacteristic, but he still managed a score of 90 (75% TOG); the most for all of the Lions. I was very keen to watch Allen Christensen (FWD, $331,000). He’s been in my side pretty much since the game opened and he did enough to keep his spot. Three tackles to go with his 16 disposals helped him to a score of 62 in 69% TOG. An early goal had me happy – and he wasn’t taking a backward step in contests. As Tbetta tweeted in his game review emoji’s, he definitely ticked boxes today. Other than Stef and Bundy, it was a dour affair when it came to the scoring, however, the Brisbane lads rotated heavily with only a handful playing more than 80% of the game. This wouldn’t have been luck, it is another reason why we can’t take a heap out of this for the Lions. Alex Witherden (DEF, $604,000) had a dog of a day. 38 from 83% TOG… which included 7 clangers – didn’t the commentators tell him about it. I know a lot are keen after his nine impressive games at the end of last season, but I’ll be staying away (I’ve got him at 23 in my defender draft rankings). We will need to see how things go next week as this game was a write off. Hopefully we see Hodgey line up with him when they take on the Gold Coast next Sunday at Broadbeach. Other players of note included Rhys Mathieson (MID/FWD, $506,000) who enjoyed some extra midfield clock. He racked up 16 disposals and four tackles for 65 in his 69% game time. Lewis Taylor (FWD, $547,000) was busy racking up 18 touches, mostly on the wing, and Tom Bell (FWD, $428,000) used his physique to help him go at a point per minute in the midfield. Mitch Robinson (MID/FWD, $542,000) appears in 11.45% of teams but his return this evening was far from exciting. The Lions got smashed in the middle, and Robinson found the ball just nine times for his 41 points. Keep an eye on Jack Payne (DEF, $170,000) who played 71% for 45 points playing in defence. He did only average 34 in the NEAFL and just 45 per 120mins at the U18 Champs. Oh – and Cam Rayner (MID/FWD, $270,000)… we will do a bit better with our money up forward with rookies. He’s not going to be in the thick of it, with a chance to rest or even spend some time in the NEAFL from all reports. The number one draft pick played 61% of the game for just five touches and 18 points. For the Swans, Lance Franklin ($677,000) was dominant kicking four snags. 86 points from the 84% of the game he played should keep anyone happy to start with Buddy happy. Same goes for the midfielders like Josh Kennedy (MID, $690,000), who top scored for the day with 96, and Luke Parker (MID, $693,000) who are both at least 10 points under-priced based on their best. We can’t take too much out of their performances due to the opposition and how they won their ball, but it was nice to see them run around there as they were. When Jarrad McVeigh is out, there is never any doubt that Jake Lloyd (DEF, $649,000) will rack up. He was in the backline, peeling off getting plenty of mark kicks (nine marks and 20 kicks to his name). 93 from 88% was exactly what we wanted to see. He’s a no-brainer if McVeigh is likely to miss the start of the season, however, he could still be an option if he’s able to play the role that he had such success with last year. Dane Rampe (DEF, $470,000) was enjoying himself, aslo taking nine marks to help himself to 92 (just 66% TOG). Callum Mills (DEF, $488,000) was playing off half-back and running up the field for 65 from 59%. Fellow young gun Isaac Heeney (MID/FWD, $649,000) played mostly in the middle for 55 (64%). With so many rotations, I am hanging out for the JLT game to make any judgement on these two – especially whether I start with Heeney. He is the most popular premium FWD option, appearing in more than 40% of teams. Of any cash cow significance, Riley Stoddart (DEF, $170,000) is unlikely to play – even if the Swans have blooded a lot of kids in the last couple of years. He scored 53 thanks to 12 touches and six marks. Junior numbers were low. You could possibly call Robbie Fox (MID, $284,000) a cash cow / rookie priced option. He played three games last year – scores of 37, 69 and 47 – and had a good day playing through the midfield today with plenty of minutes. He racked up 24 disposals and took six marks for his 87. Keep an eye on him if he can make the 22. Could be worth paying the dollars for him. An ankle injury to Callum Sinclair had Fantasy coaches on Twitter excited about Darcy Cameron (RUC, $170,000) and his stocks. He was a late inclusion for Sam Naismith and while he played mostly up forward, rather than in the ruck, he had seven disposals and three marks – which included a couple of shots at goal. Cameron is still one of the better options for your ruck bench. Throw away that key for R3… as I don’t think we’re going to find anyone better for that position. If you don’t have Tim Kelly (MID, $224,000) in your team then you need to go and do it now, just like the 24% of coaches who currently have him. The mature-aged recruit who came runner-up in the Sandover Medal last year was busy from the word go with 6 touches in the first term for 26pts. He only went on to score 48 (61% TOG) and although he won’t be in the thick of things as much when Dangerfield, Ablett and Selwood play, he looked very good early on attending a game-high 15 centre bounces. He was iced-up in the last quarter though with a slight thigh strain but it was probably more precautionary than anything too serious. Geelong also blooded some other kids who also started well. Lachie Fogerty (MID, $228,000), Charlie Constable (MID, $200,000) and Gryan Miers (FWD, $170,000) all put on the hoops for the first time and although most of these guys are a fair bit off Geelong’s best-22, they found a bit of the ball early with Constable scoring 23pts in the first quarter and finished with 63, and Miers ended the day with 45 from a full game. Fogerty laid 10 tackles a game last year for the Western Jets and only managed 4 today for his solid score of 63. Mitch Duncan (MID, $793,000) was awesome early with a game high 40pts in the first quarter from 10 touches. He only has 1.4% ownership and let’s not forget he averaged 112.5 last year with scores of 110, 160 and 131 in the AFL Finals Series, scores that don’t contribute to his price/average this year. Duncan finished the day with 72 from only 61% time on ground. Sam Menegola (FWD/MID, $719,000) enjoyed his time without the stars playing for his 76 which happened to be the second-best score for the Cats behind defender Zach Thuoy. As for the victors, Gold Coast were also missing a few stars in Barlow and Swallow. Will Brodie (MID, $356,000) knocked out a solid 61 whilst former Port Adelaide player, Aaron Young (FWD, $387,000) had his first run for his new club. He arrived at the club with an average of 55, 20pts under what he has achieved before. 4.5% of coaches are rolling with the mid-priced option at the moment and after today, they might want to cross him off the team sheet after his 49. Warnie is currently rocking with Pearce Hanley (DEF, $509,000) but he didn’t look great out there and butchered the ball several times. He racked up 16 disposals for his 61. You should be giving him another chance in the next JLT before you make any big calls. After playing just 4 games last year, it was pleasing to see the veteran Michael Rischitelli (MID, $428,000) running around. He averaged 52.5 last year and in the years before that he has averaged 74, 95 and 73. Durability is his concern but that fact he is running around in the JLT and potentially 20pts under what he can do… he’s one to give a half thought too after his 85% game time for his 46pts. Not a great score, but the fact he played is enough at this stage. An interesting one is Darcy MacPherson (FWD, $389,000). Considering his forward status and the fact he’s only $50K more than Allen Christensen, he was great in his 51% TOG for 65pts from his 15 touches. He averaged 124 (pig-like numbers) in the NEAFL last year from 13 games. Aaron Hall (MID, $690,000) was pretty sharp with a game-high 91 from only 66% game time. On the back of Ablett’s departure, he is set for a huge year if anyone is gutsy enough to take the gamble. For the rookies, Nick Holman (MID, $170,000) was the shining light with 80pts. He nailed 8 tackles in that and is 22 years of age. He’s fresh from the SANFL where he averaged 26 touches over the last two years. He has shot up the watch-list of many eager Fantasy coaches and I expect his 1.8% ownership to sky-rocket. Why nah??? Ive been dying to see this kid repeat his 56 disposal effort from a couple of years ago.. He can seriously find the footy if given the freedom. If he is going to be given some freedom by the Dogs i’m on board! O’Meara or parker for fantasy?